Washington safety Su’a Cravens reportedly informed team president Bruce Allen Sunday morning that he is retiring from the NFL, before the start of his second season as a professional. Cravens started three games for Washington last season as a rookie, and recorded 23 tackles and an interception in 11 games. You may remember Cravens being involved in a mild social media controversy last season after he suffered a concussion while making a tackle in an October 2 game against the Cleveland Browns. Cravens reportedly was prescribed glasses in the immediate aftermath, to deal with symptoms of the concussion related to vision. Cravens alarmed fans by describing the glasses as something he’d have to wear for the rest of his life, but later said he’d in fact suffered no permanent damage from the concussion. Given what is known (and unknown) about brain injuries, that’s a bit of an open question. But Saturday night, Cravens informed his fellow defensive backs in a group text message that he was retiring, a second person familiar with the situation said. Cravens, in the group message, praised each of his teammates for their skills and expressed gratitude for them and their role in his life. He said that he had enjoyed playing with them, but was retiring on Sunday and ended the text message with, “Peace out,” and then removed himself from the group chat. 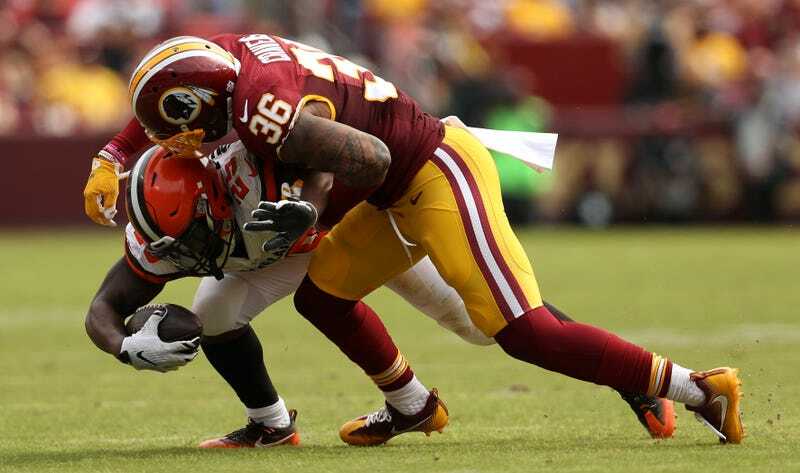 Cravens had arthroscopic surgery on his knee in early August, and though he hasn’t yet returned to practice, he was expected to return to action before Week 1, and was projected as Washington’s starting strong safety. It’s unknown how much of the decision (if any) is health or injury related—the Post report mentions “personal issues that played a role in his decision.” Allen reportedly convinced Cravens to postpone the decision in order to take time to resolve those issues, and the team placed Cravens on the Exempt/Commissioner’s Permission List while his playing future is still up in the air.